[The Republican plan for dealing with immigrants arriving at our borders] is so anti-family, so out-of-the-question that you have to wonder what’s in their alleged minds and certainly in their hearts. It was a number of months ago that the administration first told me that they did not think that the mothers [act responsibly when they] bring their children across the desert in a dangerous way. Of all of the bad things that they have done, the wrong decisions they have made, nothing is more revealing – I think – more hurtful than what they’re talking about with children. We have to put a stop to this and there’s no better way than to make sure the American people are aware of it. Full text at the link. The Weekly Democratic Party Address was delivered by Senator Ed Markey of Massachusetts. Pointing to recent spikes in oil and gas prices, the Massachusetts Democrat contended that Americans are now paying an estimated $350 more per year to fill up their vehicles than when Trump took office. 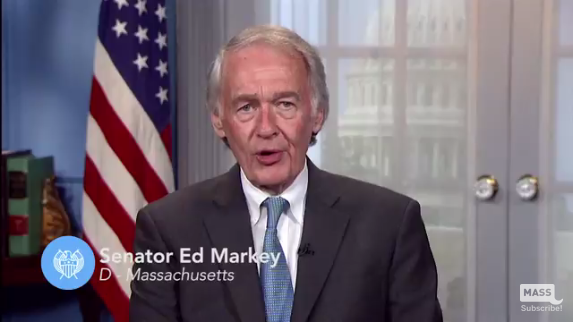 Markey attributed that increase, in part, to what he called the president’s “incoherent foreign policy,” arguing policies pursued by his administration have heightened tensions in the Middle East. He offered Trump’s decision to withdraw the United States from the Iran nuclear deal, as an example of a move that has impacted oil markets, and thus the price of gas. “Because of these actions, gas prices could keep going further up this summer, and the American family is going to pay the price for this ‘Trump oil risk tax,'” he said in the address. “How are the oil companies spending this GOP windfall? Well, Big Oil is buying back tens of billions of dollars’ worth of their own stock — pumping up their own profits rather than helping consumers at the pump,” he said, adding that exporting U.S. oil is “only a further giveaway” to these companies. No transcript was provided by Senate Democrats. Leader Pelosi: Good morning. Good morning. I’m very happy to report that this week House Democrats put forth two more planks of our Better Deal: Better Jobs, Better Pay, Better Future. One of them that will make all the difference in the world to policy here, we believe, is the Better Deal to Protect Our Democracy. The American people are paying a price for the Republican culture of cronyism, corruption, and incompetence. The President said he came to drain the swamp and he is the swamp. Actually, we said drain the swamp in 2006, corruption, cronyism, and incompetence. It was true then. It is true of them now. What is the cost of their cronyism, incompetence, and corruption in the lives of the American people? Well, just look at what Secretary Pruitt is doing at EPA and know that your children, your grandchildren will not have clean water, clean air because of his commitment to major donors and his orientation that he brings there. The list goes on and on of the price that people pay in their lives because of the commitment to special interests that the Republicans have. Congressman John Sarbanes has been a leader on this issue for a very long time. Our initiative to protect, to save really, our democracy talks about reducing the role of money in our [campaign] finance system, combating Citizens United. It is about stopping the constant spinning of the revolving door, people going in and out of government, taking their special interest credentials with them. And, again, to end the voter suppression that Republicans find so patriotic. It’s hard to believe, but that’s what they find patriotic, is to suppress the vote. I’m very proud of the work. The 15 co-chairs of the [Democracy Reform] Task Force put together an excellent piece of work. It’s gotten a tremendous response in the country. And I really believe that if the public thinks that their voices are diminished because of the role of money and special interests, then that’s what they believe and that’s what we must honor. And we must take this drastic step. I think we’re at a place that we can. At the same time, another day later, on Tuesday, we put forth our Better Deal for Teachers and Students. American teachers, as we all know, are underpaid, our schools are crumbling. We tell our children that education is so important, that they must study, it’s important to their future and to the competitiveness of our country. It’s about their aspirations to make the future better for themselves and for America. And yet we send them to schools that are under par, some crumbling, many not really up to speed, literally and figuratively, when it comes to technology and the rest. And we do not respect and pay our teachers in a manner that reflects the value that they bring to our kids and to our country. And so, this is about A Better Deal to give teachers a well-deserved raise, protect educators’ freedom to negotiate for better wages and make bold investments in our schools, including the infrastructure of our schools and the security of our schools, the technology of our schools. Other things happened this week that were not so pleasant: the President’s statement on the gag rule to rip away access to affordable preventive care for millions of vulnerable American women. We spoke about that yesterday in the press conference. We can talk more about it if you wish. But really today, with all the excitement that we have about the progress of our Better Deal: Better Jobs, Better Pay, Better Future, our commitment to build, build, build, build the infrastructure of America, all across America, from sea to shining sea. Build human infrastructure: education, putting things in schools like having net neutrality so that everyone has access, research and development and the rest, apprenticeships. The list goes on. Building human infrastructure. And the third point that I made first here was building and strengthening our democracy. That’s what we are about. That’s what this is about. So, I’m excited about some of the agreements that we’ve all come to, the consensus that is there, the connection to the American people in terms of what it means to their aspirations, and what it means to their apprehensions as well. Better Jobs. Better Pay. Better Future. Lowering cost. At the same time, today is almost heartbreaking in the magnitude of disrespect that Republicans are paying to the Constitution of the United States and to the institution which they serve, the first branch of government: the legislative branch. Today, there will be a very unacceptable, inappropriate meeting of intelligence briefings to the Republicans, which have the possibility of aiding the President’s defense in his investigation. To add insult to injury, the Speaker of the House has said he can’t go to the Gang of Eight briefing that we insisted upon – which is appropriate – because he has fundraisers in Texas. So he’s going to this earlier meeting, which shouldn’t be taking place in the first place. They said, ‘Okay, we’ll have Gang of Eight two weeks from now. We’ll have this meeting today.’ No. No, that’s not what you do, give information with two weeks in between. But to make sure we know what is being conveyed in that Republican meeting, Adam Schiff will be attending the meeting. Adam Schiff will be attending the meeting and then he will attend the Gang of Eight meeting again. I want you to understand, I have over 20, almost 25 years of experience in intelligence, longer than anyone who has ever served in the Congress. I have served as a Member of the Committee. I served as the Ranking Member, the position that Adam Schiff has now, and he has set a whole new standard for Ranking Members. And I served ex officio for a number of years. Never has there been anything so disrespectful of the Congress than what they are doing today. I have been a relentless advocate for Congress receiving information – that isn’t the point – and for transparency. We don’t have those meetings that often. They are very important meetings. And they are for the four leaders of the Committee and also the four top leaders in the Congress of the United States. It appears the Republicans in Congress and the leadership have taken an oath not to protect and defend the Constitution, but to protect and defend Donald Trump. It’s just wrong. The President has been clear that he doesn’t respect the office he holds, and now that disrespect has bled to the Congress of the United States. Washington, D.C. – House Democratic Leader Nancy Pelosi joined the Gun Violence Prevention Task Force forum to hear proposals from young leaders and students. The GOP calls for thoughts and prayers – and yes, we want to be in everyone’s thoughts and prayers but that is not a substitute for action. You call for thoughts and prayers, call for a hearing. Give us a vote. Give us a vote on any one of these bills. We reject these unsafe, dangerous priorities and continue to fight for real action to protect children in our schools, and when we people talk about the NRA, the gun lobby and that’s what our Republican Members are afraid of – afraid of? What about the fear our children have in their communities, in their schools, in their neighborhoods? Their survival. Your political survival – I say to my colleagues – is nowhere as important compared to the survival of America’s children, so let’s put them in order. Enough is enough. More on the Democratic Party’s “Better Deal” proposal. Washington, DC – Today House Democratic Leader Nancy Pelosi (D-CA), Senate Democratic Leader Chuck Schumer (D-NY), Congressman Bobby Scott (D-VA), and Senator Patty Murray (D-WA), joined by Randi Weingarten, President of the American Federation of Teachers and Lily Eskelsen Garcia, President of the National Education Association, unveiled another critical tenet of their economic agenda, “A Better Deal.” The proposal invests in the future of education by ensuring that teacher pay is boosted, schools retain a strong and diverse workforce, school infrastructure is improved, students are provided with access to academic opportunities such as computer science, music, and civics, and special education is fully funded. Democrats propose paying for this critical investment by repurposing the money used to provide tax cuts to the top one percent. Instead of allowing millionaires, billionaires, and massive corporations keep their tax breaks and special-interest loopholes, Democrats would invest that money in teachers and students. Today, House and Senate Democrats held a press conference on the steps of the United States Capitol to unveil the newest plank of their bold economic agenda, A Better Deal for Our Democracy, to fix Washington’s broken political system and return to a government of, by and for the American people. This new plank of Democrats’ A Better Deal agenda focuses on taking back the power from special interests and getting rid of the pay-to-play culture of corruption, cronyism and incompetence embodied by the Trump Administration, which has led to political dysfunction and a raw deal for the American people. Q: [The discharge petition is] now approaching 218, I think it’s at 212 signatures. Speaker Ryan this morning said that he doesn’t believe that the Queen of the Hill process is going to be able to produce a bill that the President could sign into law. But do you believe that the process, if you do get to Queen of the Hill, that it could produce a bill that you can at least send to the Senate? Leader Pelosi. Yes, yes, indeed. And I do think that the Queen of Hill gives Congress a chance to work its will in the most generous way. Everybody will have their chance to vote on, whether it’s Goodlatte, the ‘Make America White Again’ bill, or it’s pure DREAM Act, which would be ideal, the compromise, Aguilar-Hurd, which is what we want to be last so it would be the Queen of the Hill. Or the Speaker can put together a bill. Maybe they are capable of putting together a bill that they think can get bipartisan support. We haven’t seen it yet. But I’m really proud of the work that was done by Members, regular order Members, working together on both sides. This is not a leadership product. This is a product where they came together, wrote their bill, gained support. I didn’t even sign until today, at their direction, and it’s pretty exciting. And I’ll say what I said last night, and that is this President is the first President in modern times, Republican or Democrat, who has been so anti-newcomers to America. President Trump departing completing from the Bushs and President Reagan in terms of using this issue as a red meat issue to throw to his base any time he has a problem and not to even tell the truth about it. [Republican leaders] are threatening Committee assignments, support in campaigns. We hear all kinds of things that they are threatening Members if they do not abandon this. But we’ll see. Let’s see. But in any case, for now the courts are protecting the DACA. The Dreamers are a bigger number, but the DACA kids. And we hope to keep that going in a bipartisan way, with all the respect in the world for the courage of the Republican Members to support a compromise position. And I commend Democrats, too, for supporting a compromise position on all of this. He’s right about the gas prices and it would be good if that’s addressed. But she’s right about the kids – even though it’s actually an old American tradition to separate children from POC parents then sell or warehouse them we were starting to get away from. (Starting I say because Native kids are still being taken from their families and put in white foster homes – at best.) And the kids are a lot more important than gas prices. I generally highlight the topic of the Democratic Party’s Weekly Address but I can’t get worked up about gas prices when kids are being separated from their parents. Also, I am a bit torn about lobbying for low gas prices because something we don’t want people to use should be expensive! That it hits working class families in the wallet is a cause of concern. Same here. The kids are important. We’ll survive – we have before – with high gas prices. And gas should be high. Although there needs to be ways to help the lower income folks in the transition, we need to transition off gasoline – should have decades ago. Would have decades ago if not for politicians in the pay of the fossil fuel industry. But kids, they’re important. And this lot making headlines is bringing up old evils of our culture many had thought were in the past. But that white congressman who said “This is not who we are.” Got, is still getting, a whole lot of pushback from Black and Native folks saying, “yes it is.” But I will never accept the loss of a child as being “worth” waking up the country to an evil we must stop doing. – We should be “woke” without costing the lives of children. This is simply human nature. We would not want it any other way. Yes. Parents going through hell to try and give their children lives – not just better lives, but life at all – is normal, natural, and should be commended and assisted. The bigotry at the core of this is despicable. Republicans trying to protect the at-large seat in Montana are running against Nancy Pelosi instead of running for the things Montanans want. Drain the swamp, reduce the influence of corporations, reform health care — all promises Trump made but hasn’t followed through on, [Billings attorney and restaurant owner John] Heenan said. All five [Democrats running] believe Gianforte is beatable only a year after winning a special election to fill Interior Secretary Ryan Zinke’s term. They point to the 2016 elections, when Republicans swept every statewide office in Montana except one: Democratic Gov. Steve Bullock won re-election against Gianforte after the former technology entrepreneur spent millions of his own money to campaign. That shows Gianforte is vulnerable even if there is still strong support for Trump among Montana voters, Kier and Williams said. The National Republican Congressional Committee, which is supporting Gianforte’s re-election bid, dismissed the Democrats’ criticisms. “(House Minority Leader) Nancy Pelosi’s army of clones can regurgitate these talking points all they want,” NRCC spokeswoman Erin Collins said. That was the RNC’s Colin Lamb Strategy and it was good news for – Conor Lamb. Please proceed, Republicans, please proceed.